The announcement was made in the “Jeju, The Island of Peace, Talks Culture” session organized by Jeju Special Self-Governing Province and World Culture Open on Friday, May 22, in the Grand Ballroom of the Haevichi Hotel & Resort. 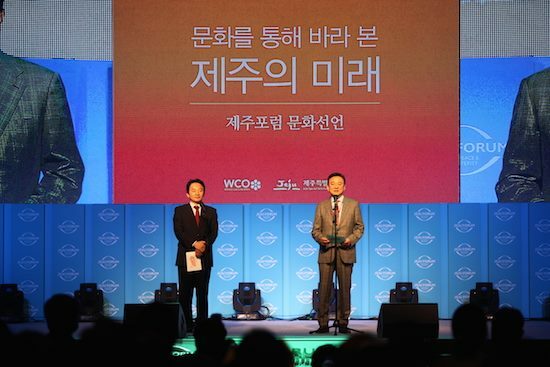 In his vision statement on culture, Jeju governor Won Hee-ryong said he had supported the session so more people could learn of the “inherent strengths” of Jeju and to support the island’s grassroots communities. Jeju stands in the midst of change, he said, and the island was becoming an incubator for “our global village future” as its rich natural resources enthuse the cultural community. World Culture Open CEO Hong Seok-hyeon echoed Won’s bullish opening and pledged to work closely with the talent found across Jeju to spread its stories worldwide. The island provides an example of how to harmonize nature and society, he said, and he vowed to provide "vision and inspiration" to Jeju’s future and even contribute to securing "peace and harmony in Northeast Asia." 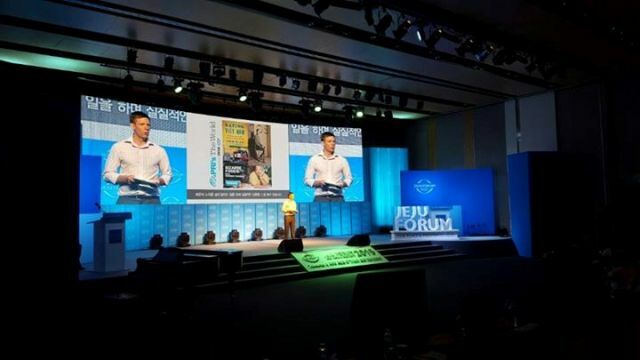 In one of the Forum’s more dramatic sessions, music then played with accompanying video as the two men jointly read out the Jeju Forum Culture Declaration. World Culture Open states on its website it is a non-profit organization that promotes cultural diversity and unprejudiced cultural exchange around the globe. Facilitating sharing and vitalization of local cultural scenes; increasing intercultural exchange through free cultural expression; and supporting the preservation and development of cultural heritage. The partnership with Jeju Special Self-Governing Province aims for balance and harmony in “government, economy, society and the environment,” and to build cultural diversity and global solidarity through a flowering of the arts. Both sides pledged to build a platform of open exchange on Jeju through creative cultural policy and a concrete action plan to make Jeju an island of culture. Jung Sinji (storyteller and interviewer); Darren Southcott (newspaper editor); Park So-yeon (local cuisine expert); Kim Beom-jin and Kim Youn-joo (cultural space curators); Lee Ji-yeong (gotjawal woodland guide and educator). The second half of the session, organized by Jeju province and 'Artists Who Love Jeju,' included a discussion on the cultural value of Jeju literature and architecture. It included presentations by novelist Jo Jung-rae and designer Paik Hae Sun followed by penal talks on how to enhance Jeju culture through design, planning and lifestyles inspired by Jeju’s scenery and heritage.